... with one major change: the new WyWires Power Broker ($TBD, but expect around $2,000), which will include a captive 6' Juice HC power cord. There is no conditioning in the Power Broker, no filtering, just good, quality wiring -- using the same asymmetric wiring scheme designer Alex Sventitsky uses in his cables. Each of the four duplexes is wired independently, in parallel, effectively isolating each one. If that's too plain-Jane, the Power Broker can be ordered with Bybee Purifiers for an additional $1,000. Casework comes from Daedalus Audio's Lou Hinkley, and is American walnut, with a figured-maple top-plate. The Juice HC power cord, also new and available from $699 for 4′ lengths, a $200 premium over the Juice II. The HC is a 7 gauge cable with a different signal propagation ratio from the Juice II, “resulting in better detail overall across the entire audible spectrum”, “with a smoother presentation of brass instruments, such as trumpet and flugelhorn”. Personally, I have no idea what a flugelhorn is; I though he made that up, but Wikipedia says it’s a real instrument. Learn sumthin’ new every day. Anyway, Alex says that he uses it as a personal voicing reference; apparently it’s pretty easy to hear when tonality changes screw this up. A Power Broker and some HC power cords will be winging their way from the left to right coast at some point in the near future. Oh, and in case you were wondering, I loved the sound in this room. 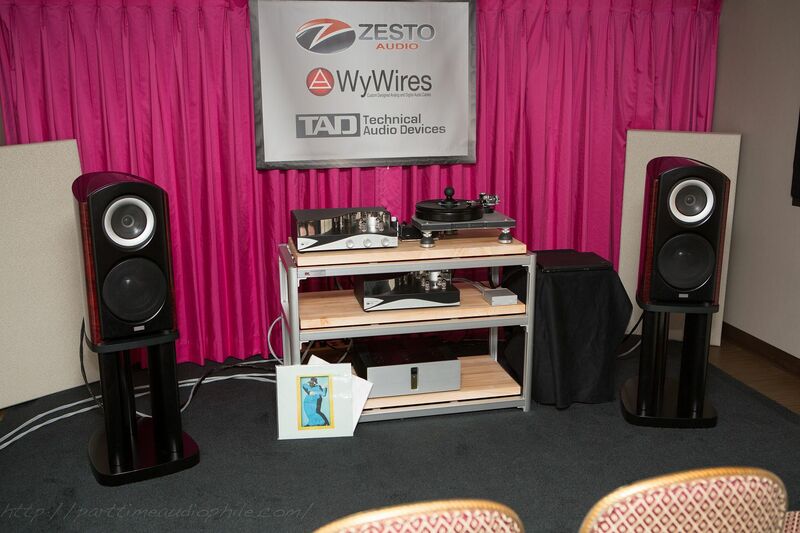 The Zesto Audio/GamuT pairing with those TAD loudspeakers (and all that WyWires cabling!) is absolutely fabulous. Best in Show contender? Most definitely! Be serious. That’s a totally made-up word.